Iran’s defense minister today denied a report that Tehran has accepted Western demands to hold negotiations on the country’s controversial missile program, according to Tasnim News Agency. 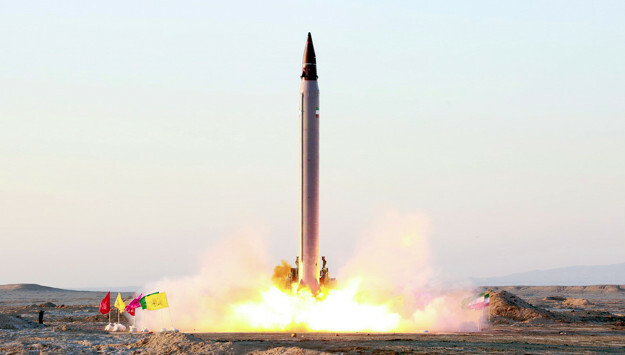 Referring to a statement by the German Foreign Ministry’s spokesman that France, Britain and Germany may hold negotiations about Iran’s missile program separate from the nuclear issue, Brigadier General Amir Hatami emphasized: “Regarding the missile program, we have not had any talks and do not intend to hold any talks.” Separately, Iranian Foreign Ministry Spokesman Bahram Ghassemi also rejected the report by the Financial Times. The newspaper had quoted the German official as saying that the foreign ministers of the three European signatories of the Iran nuclear deal, together with EU Foreign Policy Chief Federica Mogherini, have reached an agreement with Iran to hold an “intensive and very serious dialogue” on the Islamic Republic’s missile program and regional activities. “The Islamic Republic of Iran will not allow any country to interfere in its internal affairs and defense policies, particularly its missile program,” Ghassemi emphasized. Comment: Since President Donald Trump took office in January and threatened to terminate the nuclear accord, Iranian leaders have been banking on European support to “isolate” the United States to keep the nuclear agreement alive and minimize the impact of U.S. unilateral sanctions on Iran. But suggestions by European leaders to hold separate negotiations with Tehran on its missile program and regional role to “supplement” the nuclear accord have worried Tehran. In an explicit threat to Europe, the IRGC threatened to put Europe within Iran’s missile range if European powers cooperated with Washington against Tehran. “If we have kept the range of our missiles up to 2,000 kilometers and have not increased it, it is not because of technological limitations. This is because we have a strategic doctrine for the range of our missiles,” Brigadier General Hossein Salami, the deputy IRGC commander, said in a television interview. “Therefore, the Europeans should know that if they threaten us, we will increase the range of our missiles,” he added, according to IRGC-affiliated Tasnim News Agency. While the nuclear agreement does not address Iran’s missile program, the subsequent U.N. Security Council Resolution 2231 “calls upon Iran not to undertake any activity related to ballistic missiles designed to be capable of delivering nuclear weapons, including launches using such ballistic missile technology.” Iranian leaders argue that the country’s missiles are not designed to carry nuclear warheads, but U.S. officials say some of the missiles Iran has tested after the 2015 nuclear deal have been "inherently capable of delivering nuclear weapons" and are "in defiance of" the U.N. resolution.